Microsoft SQL Server is now available with special pricing from Aventis Systems for qualifying non profit organizations! Microsoft SQL Server for Charity provides non profit organizations with an affordable relationship database management software option for the storage, analysis, management, and reporting of larger sets of data! Whether you are managing large numbers of transactions and information on your supporters, cross referencing data between departments or locations, or have complex questions between large data sets you need to link together SQL Server Charity licenses are the perfect software to give not for profit organizations out of the box database functionality without the need for add on software. Aventis Systems now offers Microsoft SQL Server Open Charity Licenses and CALs to ensure your organization has the licensing required to grant user access and stay compliant. What is the difference between SQL Server Open Charity Licenses and Open Charity CALs? Microsoft SQL Server Open Charity Licenses are the first step to getting your organization started with SQL Server not for profit licenses. Aventis Systems has both Standard and Enterprise licensing to choose from in per core or server licenses! Microsoft SQL Server Open Charity CALs, or Client Access Licenses, are an important step to making sure your users and administrators have access to work within your database. 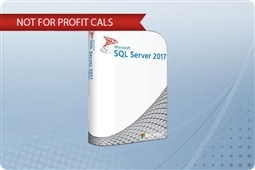 Every user of your SQL Server database will be granted access through 1 CAL per registered user or device. For remote location access both RDS (remote desktop services) and user or device CALs will be required. All Aventis Systems Microsoft SQL Server for Charity licenses are delivered via electronic download for your convenience and come in a variety of multi core and multi CAL bundles to ensure your company has easy access to the quantity of licenses they require. So shop our licenses below and bring the best in low cost non profit organization Microsoft SQL Server licensing to your business today with Microsoft SQL Server Open Charity!